"Devil in Disguise" redirects here. For other uses, see Devil in Disguise (disambiguation). "Please Don't Drag That String Around"
(1963) "(You're the) Devil in Disguise"
(1963) "Bossa Nova Baby" / "Witchcraft"
"(You're the) Devil in Disguise" is a 1963 single by Elvis Presley which was written by Bill Giant, Bernie Baum and Florence Kaye. It was published by Elvis Presley Music in June 1963. The song peaked at number three in the US on the Billboard singles chart on August 10, 1963 and number nine on the Billboard Rhythm and Blues singles chart, becoming his last top ten single on the Rhythm and Blues charts. The single was certified "Gold" by the RIAA for sales in excess of 500,000 units in the US. The song also topped Japan's Utamatic record chart in the fall of 1963. In 1963, when the song was debuted to a British audience on the BBC television show Juke Box Jury, the celebrity guest John Lennon voted the song "a miss" stating on the new song that Elvis Presley was "like Bing Crosby now". The song went on to reach number 1 in the UK for a single week. Bill Porter engineered the song for the Elvis Presley recording session on May 26, 1963, at RCA Studios in Nashville. 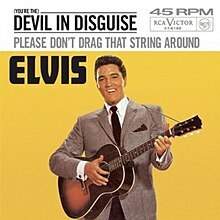 "(You're the) Devil in Disguise" and its flipside, "Please Don't Drag That String Around", was recorded for a full-length album that was scheduled for release in 1963, but RCA chose instead to release the album piecemeal on singles and as soundtrack album bonus tracks. Bass singer Ray Walker, of the gospel vocal group The Jordanaires (who also worked as Presley's backing vocalists for much of his career), is featured in the song, singing the repeated phrase, "Oh, yes, you are," before the song's fade. The recording appeared on the 1968 RCA Victor compilation Elvis' Gold Records Volume 4. A cover version by Trisha Yearwood appears on the Honeymoon in Vegas soundtrack, which consists mainly of covers of Presley songs. Punk rock band The Misfits covered the song on the extended edition of Project 1950, an album which also contained a cover of Presley's "Latest Flame". Karel Gott recorded the song in 2012. The Residents, Tom Green, Ronnie McDowell, Showaddywaddy, and Peter Kraus have also recorded the song. Scotty Moore and D.J. Fontana have performed the song live in concert. In 1977, a Finnish band called Kontra covered the song in Finnish titled as "Nainen valepuvussa" in their debut album "Ei kontrollia" (Love Records LRLP 258). Johnny Hallyday recorded the song in French in 1964. ^ Whitburn, Joel (2004). Top R&B/Hip-Hop Singles: 1942-2004. Record Research. p. 468. ^ Norman, Philip (2008). John Lennon: The Life. Doubleday Canada. p. 335. ISBN 978-0-385-66100-3. ^ "Ultratop.be – Elvis Presley – (You're the) Devil in Disguise" (in French). Ultratop 50. Retrieved February 17, 2013. ^ a b c Steve Hawtin; et al. (January 27, 2013). "Song artist 2 - Elvis Presley". Tsort pages. Retrieved February 22, 2013. ^ "Toutes les Chansons N° 1 des Années 60". Syndicat National de l'Industrie et du Commerce Phonographiques (in French). Infodisc.fr. 2013. Archived from the original on January 7, 2010. Retrieved February 17, 2013. ^ "The Irish Charts – Search charts". Irish Recorded Music Association. 2008. To use, type "Devil Disguise" in the "Search by Song Title" search var and click search. Retrieved February 17, 2013. ^ "Dutchcharts.nl – Elvis Presley – (You're the) Devil in Disguise" (in Dutch). Single Top 100. Retrieved February 17, 2013. ^ "Topp 20 Single uke 30, 1963 – VG-lista. Offisielle hitlister fra og med 1958" (in Norwegian). VG-lista. Retrieved February 17, 2013. ^ "Official Singles Chart Top 100". Official Charts Company. Retrieved February 17, 2013. ^ "Elvis Presley - Awards". Allmusic. Retrieved February 21, 2013. ^ "Offiziellecharts.de – Elvis Presley – (You're the) Devil in Disguise". GfK Entertainment Charts. Retrieved February 17, 2013. To see peak chart position, click "TITEL VON Elvis Presley"
^ "Elvis Presley – Chart history" European Hot 100 for Elvis Presley. ^ "Dutchcharts.nl – Elvis Presley – (You're the) Devil in Disguise" (in Dutch). Single Top 100. Retrieved February 22, 2013. ^ "Swedishcharts.com – Elvis Presley – (You're the) Devil in Disguise". Singles Top 100. Retrieved February 17, 2013. ^ "The CASH BOX Year-End Charts: 1963". Cash Box Magazine. December 28, 1963. Archived from the original on May 1, 2008. Retrieved February 17, 2013. ^ "American single certifications – Elvis Presley – Devil in Disguise". Recording Industry Association of America. If necessary, click Advanced, then click Format, then select Single, then click SEARCH. ^ (You're the) Devil in Disguise by Elvis Presley and the Jordanaires. Second Hand Songs.